Today is going to be jam packed around these parts, with Oscar predictions coming up in what are arguably the four biggest categories. And, luckily, they are the four categories that have the most exciting races. Isn't it nice when that happens? But let's not waste any time patting the Academy on the back, let's get right to the predicting! This is a familiar story at this point: the Lead Actress race is down to two fabulous ladies. And, like so many years before this one, those two fine actresses are Meryl Streep and a new, shiny nominee. Rooney Mara, Glenn Close and Michelle Williams: congratulations on your nominations, but this is not your year. 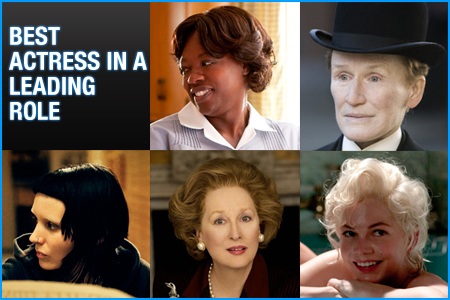 This is a horse race between Viola Davis and Ms. Meryl, both of whom were so fantastic in their roles. I would argue that Meryl did a finer job, even if just by a fraction of a percent; however, what Viola has working in her favor is that she was in a movie that is universally beloved and that allowed her brilliant performance to shine even brighter, while Meryl's stellar portrayal of Margaret Thatcher was in stark contrast to the blandness that was The Iron Lady. The fact that Meryl has gone 30 years without getting her third Oscar is insane, but I don't expect this year to be the one to reverse the curse. While Lead Actress is a two horse race at this point, there are a lot more key players in the Lead Actor category, which is chock full of amazing performances. There is indeed a frontrunner at this point, but it could honestly go any number of ways on Sunday night. I will never not be over-the-moon elated for Demián Bichir's nomination; for my money, he gave the single best performance of the year in any category and is more than deserving of this award, but unfortunately it doesn't look like it's in the cards for him. Shockingly, this is Gary Oldman's first Oscar nomination ever, so there's a slight possibility the Academy voters will give him the award that he's deserved so many times before. Realistically, though, we are looking at a victory for Jean Dujardin, George Clooney or Brad Pitt. The momentum is in Dujardin's favor, as he was the brilliant lead in the movie that is set to win big this weekend; don't think all of his charm has gone unnoticed for a second. Clooney and Pitt both had fantastic years, each starring in two Oscar-nominated movies, giving masterful performances in each and being nominated in this category for some of the finest acting work we've ever seen either do. 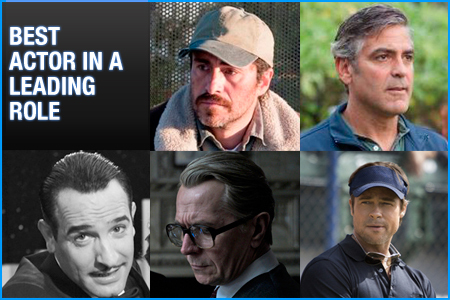 This one is a really, really tough call, and I'd honestly be fine with any of these fine gentlemen taking home the Oscar. The only thing that could've made this decision more difficult is if Ryan Gosling had been given his well-earned nomination for Drive. Two tight races full of truly wonderful performances. There's not much more you can ask for out of our your leading men and women, is there? I'll be back later today with my predictions for Best Directing and Best Picture. 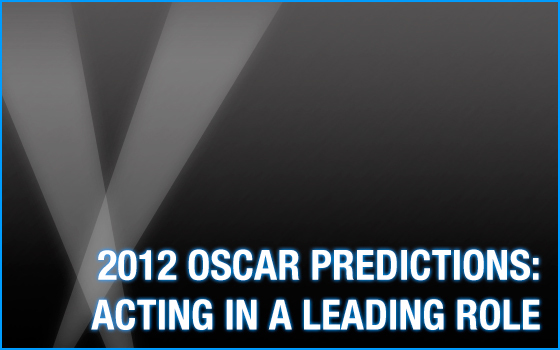 In the meantime, be sure to check out my predictions from earlier this week and enter the 2012 Please Welcome Your Judges Oscar Contest!